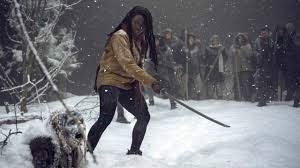 Winter finally came to The Walking Dead! I’m assuming they have experienced Winter and snow before but this storm is unlike anything they ever experienced. Alexandria had a contingy plan, gather in houses with fireplaces but The Kingdom, however, has fallen apart beyond repair and had to be abandoned. King Ezeqiel is in a world of pain. He’s lost Henry. He’s lost his Kingdom. He’s losing Carol. They were so happy for many years but the loss of a child can wreck a relationship and that is what’s happening. They lead their people out of Kingdom and try to make it to Hilltop before the storm gets too bad. Along the way you see how distant they’ve become. 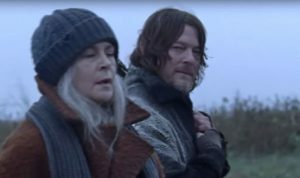 Ezekiel looks back and sees Carol with daryl and it drives him to have a private talk with Daryl asking him not to stay at Hilltop with them. Daryl doesn’t say anything and just walks away from him. 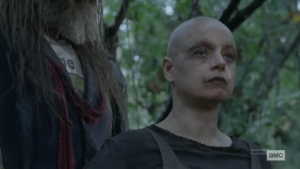 Meanwhile Lydia feels like an outcast and everyone, except Daryl, treats her like one. She blames herself for what happened and everyone else blames her. I know she isn’t to blame but she is the cause of the trouble, taking her in. Lydia finds a walker frozen in a pond. She walks out to him, he’s snapping his jaw like a a steel trap! She rolls up her jacket sleeve and is about to let the walker bite her when she turns to see Carol watching her. Carol hardly reacts and just says “Come on”. She was like “is this girl crazy?” and perhaps a part of her would be alright with Lydia doing herself in. As the storm worsens they find refuse in the remnants of The sanctuary but supplies are low and if they don’t make it to Hilltop they might die. There’s a way station on the other side of a frozen river but to get there they would have to cross into Alpha’s territory. Ezekiel is against it but in the end they have no choice, they have to try. The river is frozen enough to cross but they encounter walkers buried under the snow and they pop up to say hello! It’s the perfect time for Lydia to go off again and cause a problem. Carol goes after her and when she finds her Lydia begs her to kill her. It seems like Carol considers it but, of course, she doesn’t. She’s not very comforting, however, no hugs of comfort, just another “let’s go” and they rejoin the others. Megan was giddy! 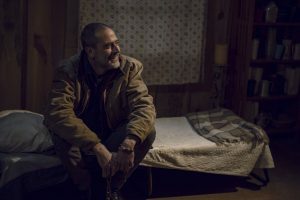 They got him out of the cell and he was hanging with Father Gabriel, Saddiq, Rosita and Eugene, He can’t help but be Negan. He was having fun making fun of their ‘foursome’ love triangle. But no matter how annoying he was he eventually got some smiles out of Gabriel and Eugene. When the fireplace blows up they have to move and head to Aaron’s house. The storm is so bad they have to travel while being attached to a rope. Then, Judith hears Dog! He promised to take care of Dog for Daryl and he’s been missing since the storm started. 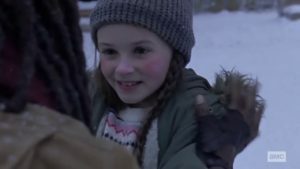 Judith takes off into the blizzard after Dog and Negan doesn’t miss a beat and goes off after her. He gets hit by debris and gets a gouge in his leg but he finds Judith and Dog and carries them to safety. Their relationship is really cute. They like each other. He’s like the crazy Uncle who listens and says funny things. Megan sees a lot of carl in Judith, too. She’s smart, feisty and as he calls her ‘special’. When Michonne gets back she goes to see Negan in the infirmary and thanks him. The King, Carol, daryl et all arrive at Hilltop. They made it! 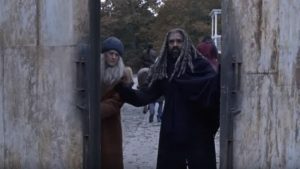 But things just get worse for Ezekiel and Carol. She actually divorces him! She hands him back his ring and says she’s going to Alexandria with Daryl and Michonne. It’s terribly sad. 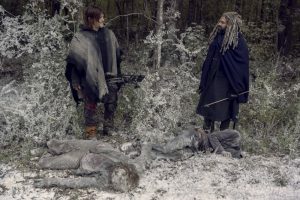 When Daryl, Michonne and Carol arrive at Alexandria everyone is so happy they proceed to have a big snowball fight! All is right in the world. We see Alpha and Beta talking about coming back form somewhere. I think they migrated South for the Winter because there was no way they could have survived out in the open during that blizzard. Alpha says they have to get ready for ‘what comes next’ and then Alpha rolls up her sleeves and Beta proceeds to whip her arm. Toughening up! 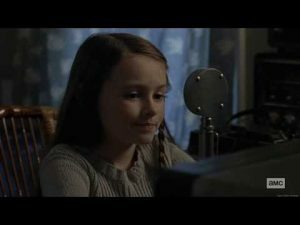 The final scene we see Ezeiel talking with Judith on the radio that Eugene built so that the communities could communicate with each other. The two of them sign off but the camera lingers on the radio. We hear some static, then a voice, a woman’s voice. Maggie? Jadis? 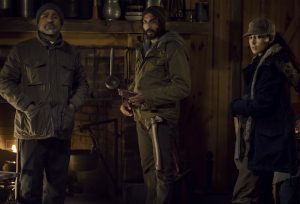 I guess we have to wait until next season! Angela Kang described that last scene with the voice on the radio was like the extra scenes during the end credits of a Marvel film. This was;t like other season finales, it was more like how Game of Thrones works where the big episode is the penultimate episode and the finale is set up for the next season. This was very much like that. I loved how some of the walkers were so frozen you just had to whack their heads off as they stood there motionless. I’m thinking whoever was on that radio is where Rick is. They have to tie it in to the show that Rick is still out there and that he will eventually reappear before the show ends. 2 Danai Gurira is leaving the show in the 10th season so I’m assuming they will treat her departure like they did with Lauren Cohan. Explain that she’s elsewhere for awhile. But where? Off to look for Rick? 4 Carol will take Lydia under her wing – Henry loved her, so will she. 5 Carol will cut her hair and revert to the carol we all know and love; the cold warrior! Season 9 has been a long and fascinating journey. We had two time jumps, met the scariest villain so far and lost our leader Rick Grimes. But the show has remained exciting and interesting and scary. I look forward to Season 10 and more thrills and surprises. Kudos to show runner Angela Kang and Greg Nicotero. I’m also hoping we get to see a Rick Grimes movie before the end of the year! Please! Until next season! Next up: Game of Thrones Final Season!! !